Here, we sew a dress for Sweet Cindy. A Dress is much easier to make a doll. Take it easy. 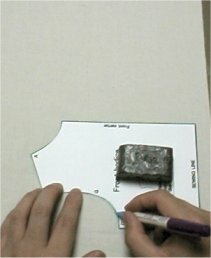 Before you begin, Set the stitch length on your sewing machine for themedium stitch. 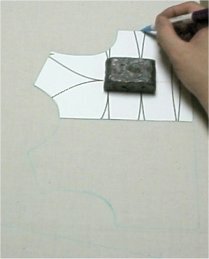 Cut out six pieces for a dress. One skirt and front bodice piece, Two sleeve and back bodice pieces. There is no pattern for the skirt. 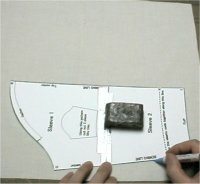 Cut a piece that measure 15" by 50". Marking back bodice Place pattern pieces on the fabric and draw around with marker to mark fringe. Turn over the pattern and mark more one fringe. Cut out it leaving 1/4" sewing allowance. 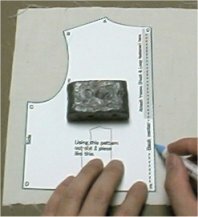 Read the instructions on the patterns to see the whole shape of the pieces. 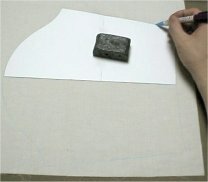 These patterns have only half shape of the fabric pieces. So you need to mark twice. Marking front bodice Marking sleeve At first, Mark around the pattern on the fabric alike before. Turn the pattern over and place it again, matching the center line together. And draw around. Thus you've got the whole shape on the fabric. Mark gather line and elastic line J-K-J on sleeves. Then cut out leaving 1/4" sewing allowance. 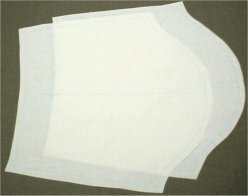 Make one front bodices and two sleeve pieces.